So it’s been far too long since I have posted! I have been crazy busy with school, five classes plus work means I am always busy! Been sick the past week and sleeping non stop. On a quick trip to the pharmacy to pick up some tissues and cough drops, I breezed by the magazine stand (like I always do.) I always look at the bridal rack to see if anything catches my eye…do yourself a favor and pick up the latest issue of Brides Magazine! I was so inspired when I got home, I decided to Instagram a picture that also has a gorgeous cover of Grace Ormonde Wedding Style. Here are my two favorite magazines with the most amazing covers! 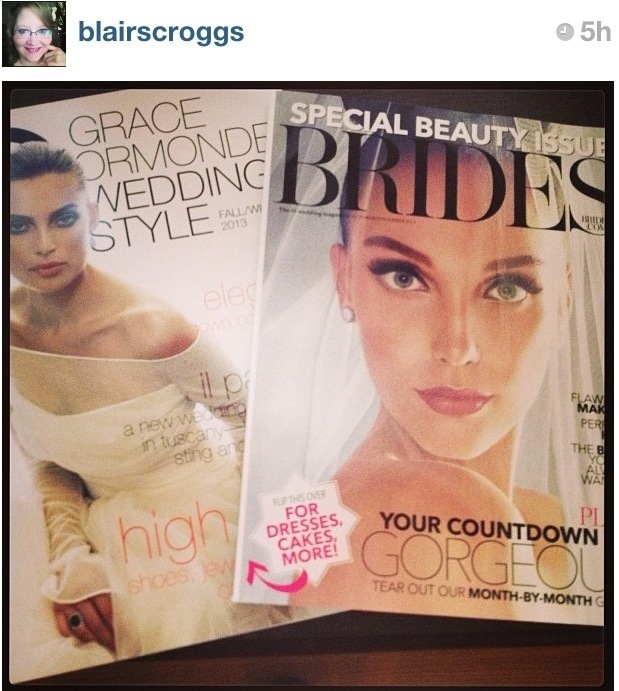 Oh, and the best part…I tagged both Brides & Grace Ormonde Wedding Style and Brides favorited my image on Instagram! On twitter, they favorited and retweeted! I know it might not sound like much, but it is a DREAM to work for one of those magazines! For more inspiration check out Brides Magazines website! Also check out Grace Ormonde Wedding Style!